Illinois takes its name from the Illinois Confederation, a group of Algonquian speaking tribes native to the area. An Algonquin word, "Illinois" means "tribe of superior men." Illinois ranked first in the nation in 2014 in both generating capacity and net electricity generation from nuclear power. Sears' naming rights to the tower expired in 2003. and, effective June 2009, the building will be renamed "Willis Tower" for London insurer Willis Group, a move many Chicagoans are not very pleased about. The Chicago River is a river that runs 156 miles and flows through Chicago. The river is notable for the 19th century civil engineering feats that directed its flow south, away from Lake Michigan, and towards the and into the Illinois and Michigan Canal and the Mississippi River. This was done for reasons of sanitation. Museum of Science and Industry, Chicago. This impressive museum features more than 800 fascinating exhibits, ranging from the U-505 submarine to the ever-popular coal mine. Confluence of the Ohio and Mississippi Rivers, Cairo. The meeting of the Ohio and Mississippi rivers is best viewed from historic Fort Defiance, a one-time Civil War post commanded byGeneral Ulysses S. Grant. Cozy Dog Drive-In, Springfield. This Route 66 landmark is home of the one and only Cozy Dog, a tasty battered and fried hot dog on a stick made from an original family recipe. The state of Illinois is perhaps most famous for its popular city of Chicago, which is one of the biggest and most liveliest cities in the country. It has an overall land area of almost 58,000 square miles. Illinois is also the 5th ranked most populated state as well as the 25th ranked most extensive state. The state is often considered to be the heart of the entire country based upon its small but powerful industrial cities combined with the agricultural productivity in the central and norther regions of the state. The state is also one of the countries biggest transportation points, with the Port of Chicago joining Illinois to many other global ports through the Great Lakes and the St. Lawrence Seaway out to the Atlantic Ocean. There is also a major transportation route though the Mississippi River and Illinois River. Furthermore, the O'Hare airport in Chicago is recognized as one of the biggest airports in the world. 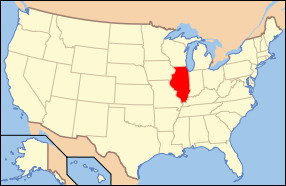 Illinois was inducted into the United States in 1818 after early settlers started arriving from the south. The states population grew accordingly, from north to south, which is why Chicago was established at a later time in 1830. In 1900, the states overall industrial expansion created many jobs in the norther cities and coal mining became big in the central and southern regions of the state which drew immigrants all the way from Southern and Eastern Europe. The state of Illinois was also a crucial manufacturing city during both of the world wars. Illinois also is home to four U.S. Presidents, including Abraham Lincoln, Ulysses S. Grant, Ronald Reagan, and Barack Obama. To honor president Lincoln, the state adopted the slogan “Land of Lincoln” which is proudly printed on all state license plates. The economy in Illinois is largely based around its agriculture, primarily soybeans, corn, cattle, hogs, wheat, and various dairy products. The industry is also a huge part of the states economy and mainly consists of food processing, machinery, chemical products, electrical equipment, metal fabrication and products, printing and publishing, petroleum, coal, and transportation equipment. Illinois is definitely a major contributor to the U.S. Economy as a whole and proves to be a prime tourist attraction due mostly to its thriving city of Chicago. Land of Lincoln, Ulysses S. Grant and ... “Wild Bill” Hickok Memorial, Mechanic and Ottawa Sts, Troy Grove. The Memorial, located in a small park, marks the site of the birthplace of James Butler “Wild Bill” Hickok. A plaque on the granite monument honors Hickok as “a scout and spy in the western states to preserve the Union in the Civil War,” praising “his services on the frontier as express messenger and upholder of law and order.” The monument was dedicated on August 29, 1930, and in 1999 a large carved-log bust of Hickok was added to the park.